I understand your basis of philosophy Ms. Madison but I beg to differ. This vegetable needs a second look. I posted a recipe for bhindi masala last July and I call for a quarter cup of oil, which is still pretty modest in the oil department when it comes to achieving a nice carmelization. Treating the okra in the oven first makes thing so much easier. Less oil is used, and you don’t have the risk of the okra falling apart as they sometimes do when you are trying to cook them just right. Basically this method is killer. I just love it and I really wanted to share it. I have heard southern chefs talk of baking okra first before “cooking” with it but I never applied it to Pakistani cooking. I have grown so fond of this recipe that it is a dish I turn to when I need an attitude adjustment. It might be the connection I have made with how this dish came to me. When I had my son a few months back, my friend would bring our family dinner to help out and take some pressure off of keeping food on the table while I was recovering and bonding with my bundle of joy. It was such a loving gesture that now when I put a bite of this Bhindi Masala in my mouth, I rekindle that emotion. Thank you my dear friend for introducing this to me and for being there when I needed it the most. Friendship and a connection through food is a powerful thing. Share your favorite dish with a friend today and build a memory for a lifetime! Okra is also very beneficial to your health. High in vitamins like A, Thiamin, B6, C, folic acid, and riboflavin, calcium, zinc and dietary fiber. It is recommended that pregnant woman in 4-12 weeks of gestation period eat okra because it is high in B6 and folic acid which is essential in the neural tube formation of the fetus. It is also great for blood sugar regulation and digestion. Here’s a fact- In WWII the shortage of coffee beans made them use okra seeds as a substitute for coffee. 3 pounds fresh okra, when picking out okra choose the ones that are bright green and about 2-3 inches long. The larger ones are tough. Pre-heat your oven to 400 degrees F. Have a baking sheet ready, lightly coated with oil. 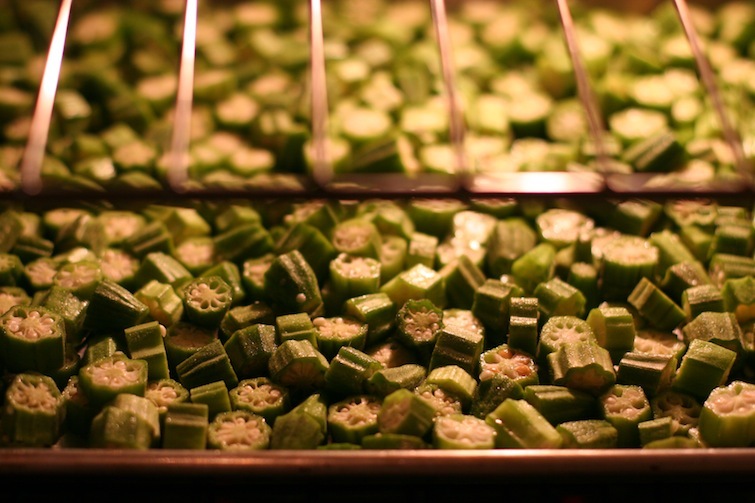 Wash and pat dry the okra then cut them into half-inch rounds. Evenly distribute them on the oiled baking sheet and roast them in the oven for about 8-10 minutes or until they start to brown on the edges and take on a deeper green color, just be careful not to over cook them or they will loose all of their moisture. Now take them out of the oven and set aside to cool, the steam that they set off will help them release from the baking sheet more easily. In a large nonstick sauté pan add the oil, onions and a teaspoon of salt over medium heat. Adding the salt at this point will let the onions loose some of their water and help them to turn golden brown. Cook the onions until they start to turn golden brown, about 5 minutes. Next add the spices, serrano chilies and tomatoes and gently mix to combine. Continue cooking until the mixture starts to wilt and caramelize a bit. You do not want to loose the structure of the ingredients; they should still be standing on their own in the mixture. Now add the roasted okra and again, gently stir to combine, cooking for another 5 minutes until all of the flavors have melded. Taste the dish at this point, adjust the salt and add the black pepper to taste. 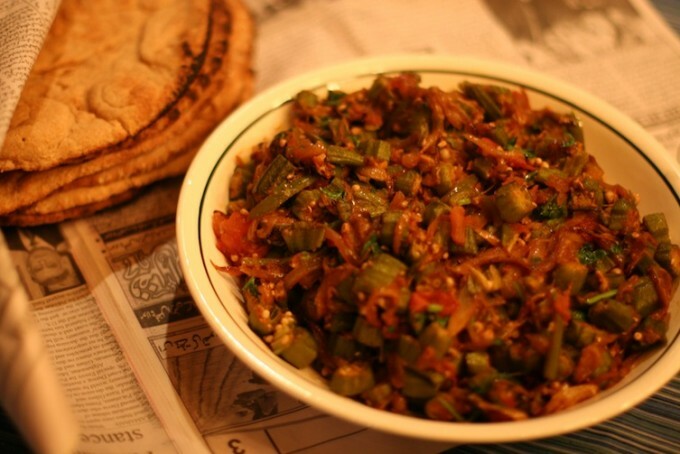 Sprinkle the chopped cilantro over the top and enjoy with some whole-wheat flat bread also known as Chapatti. In the summer time a salty lassi tastes great with this dish. In a blender add the first 4 ingredients and blend on high speed until the mixture is frothy and the ice cubes are fully ground into the mixture. Adjust salt to taste. 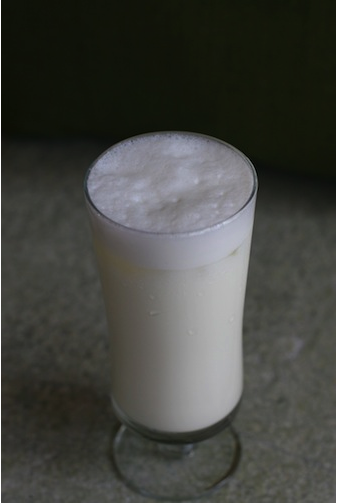 A salty lassi should be just that, salty. Also consider the dish you are eating this with because if the dish is saltier, than you will need to add more salt to your lassi. Serve over ice in a tall glass.